Illustrations: 12 black-and-white photos, 1 line figure. This pathbreaking book is the first full-length study of the rise to power of Jiang Zemin, now the central figure in China's "third generation" of leaders. Tracing Jiang's beginnings as a student in the underground Communist movement in Shanghai through his appointment by Deng Xiaoping as party general secretary and his sudden elevation to central authority in the wake of the 1989 Tiananmen Massacre in Beijing, Bruce Gilley offers a fascinating and highly readable look at how Jiang Zemin has secured his position as one of the world's most powerful figures. 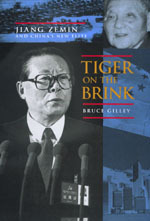 Gilley follows Jiang's life and career from his early years as the adopted son of a revolutionary martyr, through his training in Western science and engineering, to his emergence as what many believed would be an interim figurehead in the wake of Tiananmen. Gilley shows how Jiang instead persisted as China's key leader following the death of Deng Xiaoping: While he shared the concerns of the last of the Party elders—including their idealistic views of Chinese socialism—he also accommodated the younger generation of economic reformers who have helped China to achieve staggering growth in its domestic economy and foreign trade. Gilley's analysis of the careful and methodical transition of power from Deng to Jiang during the 1990s is a remarkable study in complexity and contrast, clearly illustrating Jiang's ability to either placate his allies and adversaries or ruthlessly exploit their weaknesses. Based on first-hand interviews and primary documents as well as a variety of mainland Chinese and international media sources, Tiger on the Brink is an unprecedented and immensely revealing look into the highest echelons of Chinese politics on the eve of the twenty-first century, and will be of interest to anyone concerned with the world's most populous nation and its newest emerging superpower. Bruce Gilley is Hong Kong correspondent for the Far Eastern Economic Review.